A dull amber glow, numbers dimly lit. Kilohertz and Megahertz. AM and FM. Volume and Tuning. Slowly sliding up and down the dial, a static white hiss, punctuated by sudden bursts of sound. The news or weather, a commercial for a local car dealer, the latest entry in the top forty. The signal drifts in and out of tune, searching for that sweet spot where Schoenberg accompanies Bachman Turner Overdrive. Waiting for the long dash that signals two o`clock. Exactly. Radio remains the most enchanted of media. Like some spirit, the voice passes silent and invisible through the open air, to come crackling in the depths of our speakers, a mysterious visitor in the night, a guest in the morning. And the very fact that it is nothing but a voice, nothing but something to be heard, only adds to the enchantment. As listeners, we have to complete the signal, imagine the colours, the smells, the textures. Radio lets us add ourselves to the message, become part of its meaning. In its glow we commune with ourselves even as we commune with the other. It is this quality of radio, its uncanniness, its ability to seem both intimately familiar and perfectly strange, that is captured in Tom Robinson's 1984 single, "Listen To The Radio (Atmospherics)." The song first appeared two years earlier as the opening track of North By Northwest, Robinson's debut lp, following a string of mid-seventies successes in TRB, including the now classic chant along, "2-4-6-8 Motorway." Robinson's outspoken and trenchant criticisms of the Thatcher government, together with his open embrace of the struggle for gay and lesbian rights, kept him in the spot light in the early days of punk rock, but his albums sold poorly, leading him to disband TRB and try again with the short-lived post-punk outfit, Sector 27. 1983's "War Baby" saw him belatedly return to the charts as a solo act, and in the following year a cover version of "Listen To The Radio," by the Canadian band Pukka Orchestra, made it into the top twenty north of the 49th Parallel. Sensing a possible breakout hit, Panic Records issued a re-recorded version, giving it a new arrangement and more radio friendly production, and adding a co-writing credit for Peter Gabriel, who apparently suggested some of the lyrics. 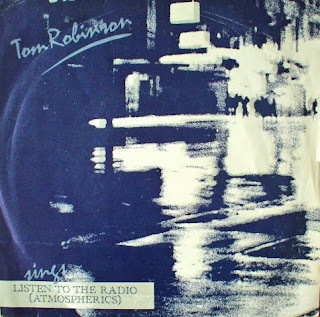 Robinson's voice is one of the most moving of the mid seventies and early eighties. Smoky, at times weary, but somehow still defiant, it carries the listener with its impressionistic tale of the life of a minor bureaucrat behind the iron curtain where only the radio brings news of the outside world. "Atmospherics after dark," he sings. "Noise and voices from the past / Across the dial from Moscow to Cologne." Only radio brings such consolation, put the coffee on and smoke another cigarette. Here is the twelve-inch, extended version of "Listen To The Radio (Atmospherics)," together with its b-sides and, as an added bonus, The Pukka Orchestra's funked out eighties dance version. Tell us which you prefer! I prefer the original with its appropriately atmospheric feeling and the long groove section where the instruments talk to each other. I grew up on the Pukka Orchestra version (and knew no other) so it was pretty mind blowing when I finally got to hear the original -- for which I developed a strong preference. The remake has its own style, though, no denying it.